Growing up on the stream, Josh Hedrick knows most of the “HOT spots”!! He specializes in trout and small mouth bass. If you’d like to try something different and adventure into the river, stocking trout begins in January and continues through the end of May. 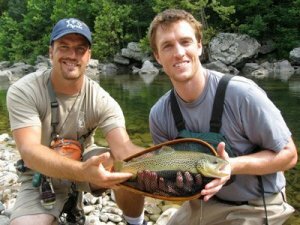 Creel limits are 6 trout per day on the North fork of the South Branch of the Potomac River. You can conveniently purchase a fishing license and trout stamp in the Smoke Hole Resort gift shop.